The thing that disturbed me, once I looked “sideways” at the last drawing in his article, was his comment that …. that for some reason or other, the differential Mu-Stage does not seem to operate correctly, when used with a traditional LTP. As we can see, what has happened here, is that the Voltage Amplifier Stage input Triodes, the ones that I also used, now have their “upside down” replicas, which also work into the same Cathode resistors of the LTP pair, before those currents are sunk down into the negative supply. Mind you: not into a Constant Current Sink, but straight into the -1/2 B-. Actually, these are just two independent LTP’s, whereby the “other side of each LTP is supplied from a constant +1/2 B+ voltage. So, what is happening here is a sort of doubled differential setup, where the differential input signals are fed “diagonally” into a ”H-bar” setup. The H-bar consists of two LTP differential amplifiers. Try to look at this differently and exchange places of the two lower tubes, so as to ‘get rid’ of the central criss-cross wiring of those upper triodes. Then you shall come up with a “H-bar” – for me it is much more “readable”. The four GS, or Grid Screen resistors, antiparasitics, in my variation become the: R24, R28, (upper deck) and the R29, R30 (lower, upside-down deck). What we have here is a pair of differential amplifiers without degenerative feedback (… But please, do not build it, because it is flawed). The fist pair are the tubes V1 + V3, working without degenerative feedback into their “common” R12 current drain resistor. The second pair is constituted of the tubes V2 + V4, working without degenerative feedback into their “common” R13 current drain resistor. Now comes the gimmick: the two resistors MEET, and their joint currents are sunk into the Constant Current Drain. 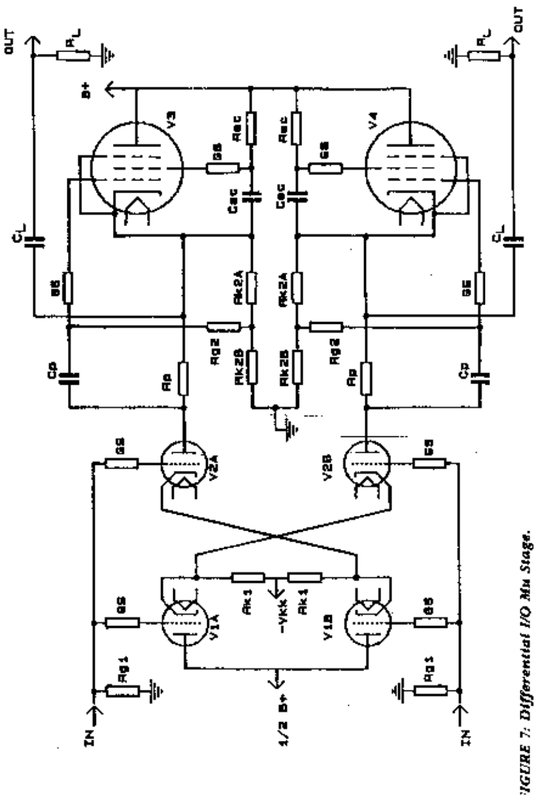 In essence, this is a differential amplifier of two differential amplifiers. I suppose(d) that Mr. Kimmel’s original concerns related to the fact, that he drained the LTP current into a plain vanilla resistor, and not into a current sink. This indeed could have provided for some “problems” due to those crazily stiff impedances as provided by those “silicon pentodes” at the very top of each Mu-Stage. I believe(d) that this will / would be much less of a problem if we use an orderly-proper constant current sink here, as shown as one of the viable options. But just for the sake of clarity, let us analyse that is happening here. For the mind-stretchers sake, let’s just assume that we have a not-quite-symmetrical signal on the inputs. Let us assume that the left hand input receives a positive pulse, but the right hand side “forgets” to provide a negative pulse for the sake of pure symmetry. Upper Left Triode V3 conducts more. Therefore, the potential of it’s cathode, the one on the resistor R12 rises and therefore, the current flowing through V1 falls by close to exactly the same amount. Now, but the same input signal is also passed over to the grid of the Lower Right Tube V2. The Constant Current Sink forces the sum of the currents from the R12 and R13 resistors to be equal, i.e. forces the sum of the currents of the two differential pairs to be identical. … But should it ? NO! It should NOT!! This is definitely an Error in the drawing above. the two differential pairs should work totally autonomously of each other. Any form of “joint sinking” would only muddle up the picture here. So, with such a setup, with two stiff constant current sinks, now you can plainly see, that even if we do NOT provide a symmetrical signal into both of those two differential inputs, the circuit as directly above will act as a self sufficient phase splitter. Neat. It will it provide some extra level of differential symmetry to the circuit. 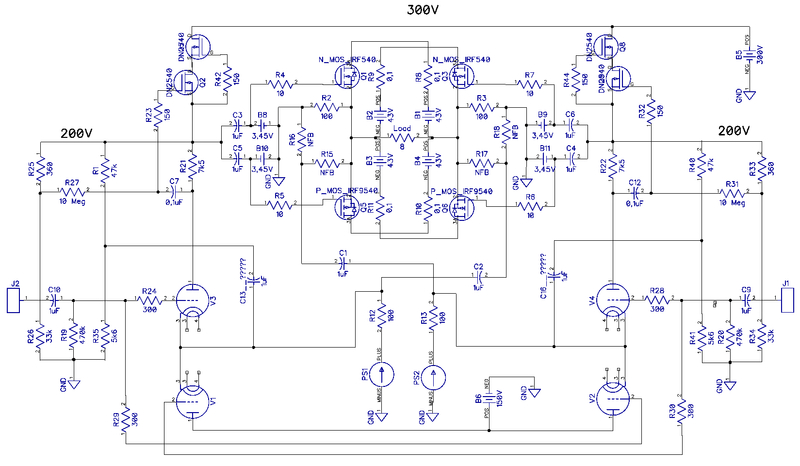 A “self-balancing” act, albeit at the cost of an extra double Triode, if you care to use such an additional component and implement this bit of additional complexity. 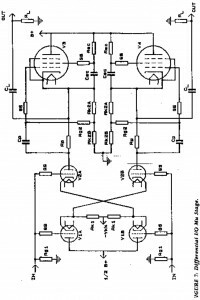 Not withstanding the former, I still believe that the simple “two-triode” differential LTP setup (as shown in the previous part of this series of articles) shall perform pleasingly, PROVIDED that the sink is an obligatory CONSTANT current sink. But what about all the rest of the two symmetrical “global” feedback loops ? Those that were fed into those “shared” LTP resistors R12, R13 ? The feedback paths via the NFB coupling caps, as it was drawn before ? I simply reconnect them to the diagonal branches of the network, to the “pairs” of cathodes: V1+V3 and V2+V4, respectively. For the sake of not “changing” too much at one go, I left those resistors R12 and R13 intact. But is there any sense in that ? Apart from the visual comparisons sake, there is no sense of that at all. Please recall that a Constant Current Sink has a very high impedance, so these resistors do not change a thing – they are not needed here any more. But the caps that provide the AC “feed in” from the global feedback loop shall work correctly. 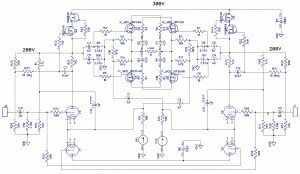 This “last” circuit should work correctly, as I believe. (But just to be on the safe side, in the next article I will show you how I would do it so as to feel more confident about it). And what about the “pentode” version thereof ? I think that I shall “skip” the “true pentode” version hereof, as there is already a fair share of tubes in this circuit. 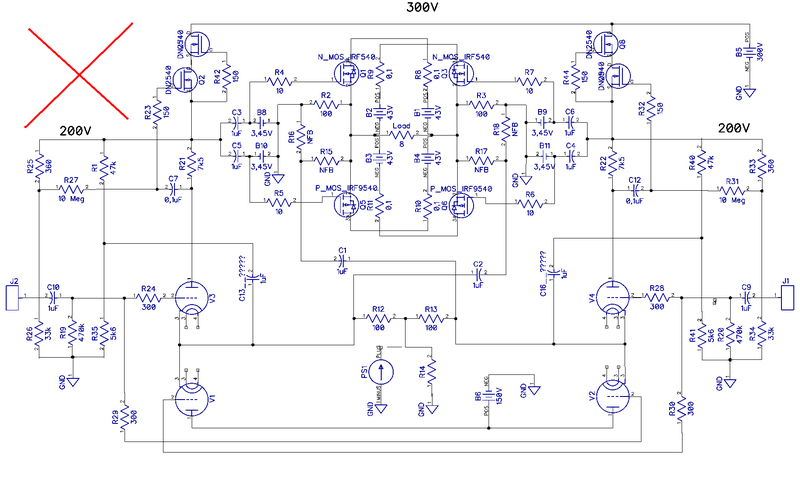 Let’s call this circuit the Cloverotron 4L, V.4.0, … or the “Super-Symmetrical” Cloverotron version. (C) zjj_wwa of hiend-audio.com …. … but with very extensive leveraging on the works of Mr. Alan Kimmel, whose greatness I herewith acknowledge in full. P.S. 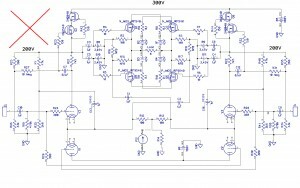 The IRF540 and IRF9540 are supposedly not the best choice of mosfets in any audio circuit, not just this one. They supposedly muddle up the high frequencies ? Anyone can confirm that ? Any hints on a better choice of silicon for this project? For example: What do you think of the “LATERAL” Mosfets, like the IRFP240H? …. Or the IRFP9140? These should work much better, should they not? Some people claim that they indeed would …. Reconsidering again … that feedback thing … seems too simple to be true. Something “does not click” …. I have a a feeling that this configuration is missing exactly four cathode resistors and two extra feedback caps …. But this I shall clarify (or muddle up) the next time.